Each morning between 6:00 and 6:30, a male cardinal perches in the arbor vitae at the back of our yard and sings in the predawn darkness. His melodious whistles serenade his mate, define his territory and bring cheer to the cold morning. When the sun is higher, he whistles a more intricately patterned call. Soon his mate comes to feed at the suet brick while he watches from the cedars, a red ornament decorating the green fronds. His lady is softly colored in olive and brown highlighted with pinkish red. I haven’t heard her song yet this year, but female cardinals are able to sing as lovely as males, and soon she will join him — especially when they begin nesting, to communicate location and the need for food. This cardinal pair has nested in our hedge for the past two summers. Why does the sight of a cardinal bring joy to so many people? 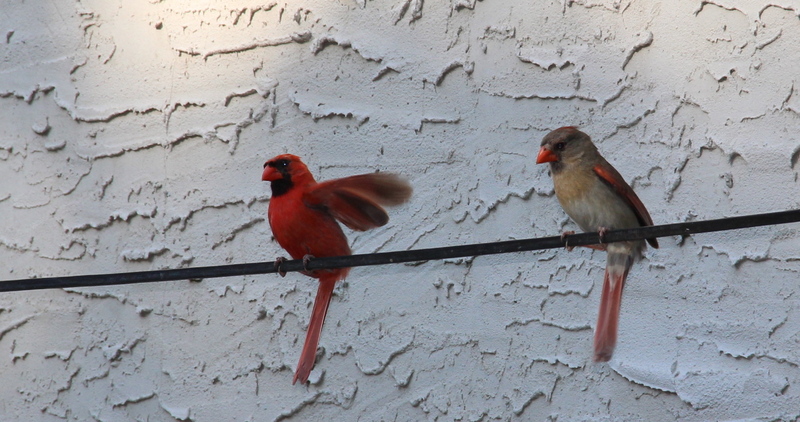 Cardinals are common, year-round residents throughout most of Minnesota, the eastern United States and Mexico. Yet, spotting a flash of red in a tree top, at a feeder, or in a garden is always delightful. For me, it is because cardinals sing when most other birds are silent — on frigid late-January mornings and sweltering late-summer afternoons; and because, most summers, they raise a family in the hardwood hedge in our backyard; and, simply for their red brilliance against the winter landscape or among the purple and gold in our September garden. A common bird, perhaps; uncommonly beautiful, most certainly. 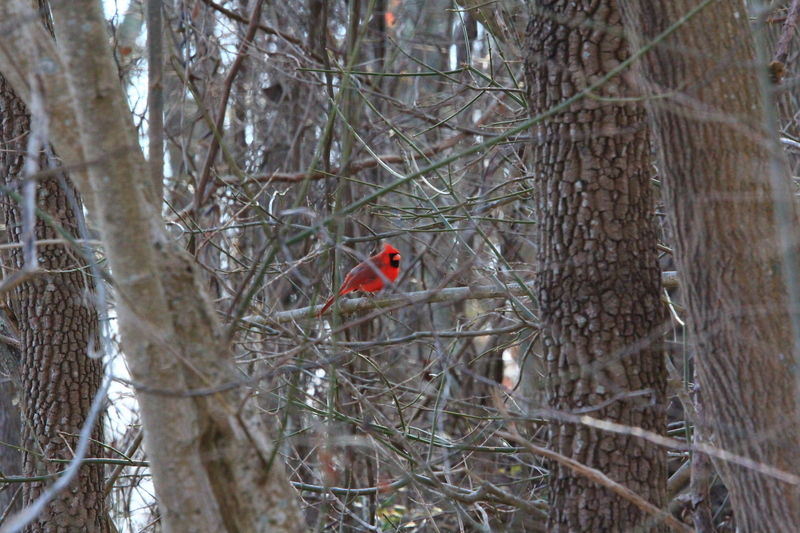 A male cardinal glows in the stark winter woods. © 2014 T. M. Murray; used with permission. This entry was posted in Backyard Nature, Birds, Spring and tagged cardinal, Spring, St. Paul MN. Bookmark the permalink. So glad you’re hearing the songs that cheer you! I heard some lovely chirping yesterday morning and thought of you. I love the idea that neighbors may not speak to each other, but may glance at the same views, catch the same starlight, hear the same bird songs, be refreshed by the same breeze. Thank you for the beautiful thought, Lois — and I also love the rare occasions when I’m talking with a neighbor and we peek at the nests in the hedge, see a beautiful bird, an unusual butterfly, or some other lovely gift of nature that we can share! Count me among the many people who love cardinals. Thank you for the beautiful images you created and… Happy St. Patrick’s day! Thank you and Happy St. Patrick’s Day to you, Linda! Yes, they do. I wonder if they’ve started their spring song yet. They are singing their spring songs now!